We launched Layers of Love on On February 24, 2010. What a year it has been! 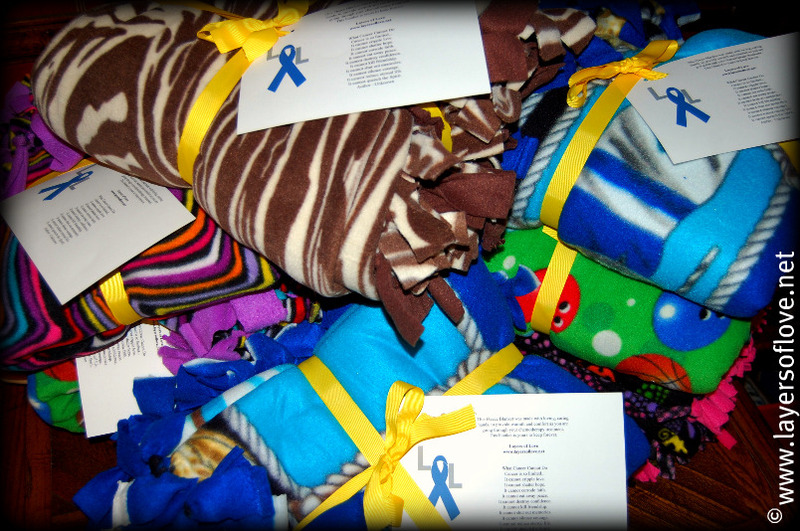 What started with a simple idea and an email sent from a dear friend late at night, has blossomed into a full-blown non-profit, collecting brand new homemade fleece blankets to provide comfort and warmth to chemotherapy patients. Layers of Love started by collecting blankets specifically for those chemotherapy patients at Cooper Cancer Institute in Voorhees, New Jersey. We completed our goal plus some, and now we are close to meeting another goal for the chemotherapy patients at Lehigh Valley Health Network. This year, Layers of Love had a great amount of help from very generous people. We were lucky enough to work with many community groups, individuals, teens, charter school students and college students, all toward one common goal, providing comfort and warmth for people who need it most. We received a HUGE lift from a Life Scout Sam Keefer, whose Eagle Scout project was to not only collect blankets to benefit the chemotherapy patients at Cooper Cancer Institute, but he also organized and ran a fundraiser, plus organized a volunteer event to put over 50 blankets together. We also held our first Fleece Blanket Tying Event at Palmerton Library. We had a lot of help from volunteers who gave up a night of their time to come out and help put blankets together. It was a lot of fun. Another fun group was the group of teenage girls who came over our house for a Fleece Tying Family Fun Night. My daughter and her friends had a lot of fun. Not only did we receive generous donations of tied fleece blankets but we also received handsewn blanket donations. Along with those, we also received bolts of fleece fabric from a wonderful mother and daughter. That donation in turn led to a church youth group pairing up their fabric with the donated fabric to make beautiful blankets for more chemotherapy patients. Donations don’t have to come locally, and many donations to Layers of Love did not. We were contacted by a dorm of college students at Purdue University who made four very special blankets for Layers of Love to be donated specifically for chemotherapy patients who are battling breast cancer. But not all blanket donations came from community groups, many came from individuals from all over the globe, we have even received blankets from as far away as Ireland! We also had the privilege of working with another charity very closely during the month of November. Friends Like Us is a wonderful children’s charity. Friends Like Us is a non-profit childhood cancer organization with a goal to help children who have been devastated by cancer. They provide children who have been diagnosed with cancer undergoing chemotherapy a customized chemo bear with interactive accessories and a children’s cancer book. We are looking forward to the new year and are very excited to be working with Friends Like Us again. We will have more information, and a full official announcement on this campaign right after the new year. Those words stand true to this day. Layers of Love would not be where it is today without all of your generous donations. We are very proud to say that to date we have received more than 108 blanket donations. Along with donations to both Cooper Cancer Institute and upcoming to the Lehigh Valley Health Network, we have also received numerous emails from individuals requesting blankets for loved ones who are currently undergoing chemotherapy treatments, we are pleased to say we have not turned down a single request this year. We are so proud of everything we’ve accomplished this year, thanks to you. We rely on your generous donations, and you have not let us down. We are so grateful for each and every donation we have received, and to all of you we say THANK YOU. As we are moving on into the new year of 2011, we are looking forward to helping even more chemotherapy patients. We have a lot planned to help us reach our goals. At Layers of Love, we don’t plan on resting until every chemotherapy patient who needs one has received a brand new fleece blanket to provide them with comfort and warmth as they go through their treatments. From Layers of Love to you and your family, Happy New Year. This entry was posted in Donations and tagged 108, blankets, cancer, chemotherapy, Cooper Cancer Institute, Donations, Friends Like Us, layers of love, Lehigh Valley Health Network, New Year, Purdue University, thank you. Bookmark the permalink. Happy New Year Patty! And congratulations for all you and Layers of Love have accomplished! You said in this post that Layers of Loved started with an idea…I would add ‘and a very loving and generous heart!’ This was an amazing experience for Sam who, because of the project, is now an Eagle Scout with Troop 42 in Moorestown, NJ. I remember how quiet it was in the car on the way home the day we delivered the finished blankets. The impact of such a simple gesture was so profound and moving. I’m sure those feelings will stay with Sam and all of those who accompanied him for some time to come. Thank you for your idea…and your very loving and generous heart! Wishing you every grace and blessing in the New Year!